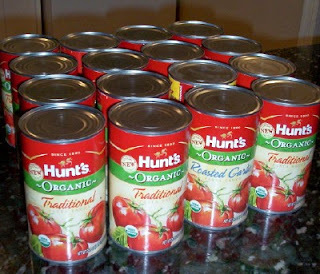 Thanks to Frugal Upstate, my pantry is stocked with Hunt's Organic Pasta Sauce from Dollar Tree. It's the next best thing to canning my own. I bought one can for every week until the expiration date. That takes my grocery budget for the week from $50 to $30. I'm going over the current sales flyers tonight and planning a tenative menu for my cookoff with Amy this week. You mean that, except for the pasta sauce, you will feed your family M-Sun for only $30? And you won't use your pantry stockpile? That is $1+$9/21 per meal? And here I was congratulating myself on 'only' spending $5 for tonight's sandwiches! Jora, $5 is great! You're doing well! Amy and I are only comparing our dinners, Monday through Friday. For those five meals I will purchase everything I need from this week's sales ads--so those ingredients must come from that $30. I'm hoping to keep each meal under $5 total. Our lunches are usually leftovers from dinner the previous night. The remaining meals can draw from my pantry--because I stockpiled my best buys in meats, etc, in previous weeks. As $20 in sauce now lowers the cost of my groceries over the upcoming few weeks, so will my previous good buys compensate for the big buy this week. Breakfasts will come from the pantry oatmeal, eggs, etc. I'm always a little, uh, liberal in my interpretation of expiration dates. I know that there is a wide variation in comfort levels on this point! If your budget allows (and I confess that I'm not quite following the math of the challenge!) could you purchase more of the sauce and pour it into freezer bags or containers for freezing, thereby extending the expiration? Meredith, you bought these items to go in your stockpile, not be included (at least all of them) in your weeks menus. I would not count that as money spent of the challenge. good luck!